This is a 90,000 word stand-alone novel with two quirky heroes—one who actually likes to vacuum, and one who enjoys studying Weakly Compressible Homogeneous Isoptropic Turbulences. I absolutely loved this book! This story about the unlikely relationship between a geeky professor and his live-in housekeeper manages to be both smart and funny – and I really loved both Marek and Pete. Marek is fabulous as an eccentric scientist. Think Dr. Sheldon Cooper – with a heart and some self-awareness. While Marek explores the stars, his housekeeper, Pete, manages his home and his life and makes sure he stays slightly grounded in reality. These two work so beautifully together that I wondered how the author would draw out the romantic tension for an entire novel. But it works. Before these two can make a relationship work they both have a whole lot of life stuff to sort out. This is a steamier read than I expected from the blurb and the chemistry between Pete and Marek is pretty special. Beyond the romance, there are some thought provoking insights into relationships and conversations around roles and equality and power that I really enjoyed. I always love the quality of this author’s writing and I love that this story manages to be intelligent without adding too much angst or unnecessary conflict. When I read the blurb for this book I couldn't wait to read it! The book was sent to me right before I went on a long weekend trip and I was so excited to jump in. That being said, it didn't wow me like I thought it would. I didn't read the previous series that this was a spin off from. Maybe I should have and I might have enjoyed it more? Maybe? I thought we'd see Marek and Pete meet and see their relationship from the start. Nope. I just felt like I was missing something. While I enjoyed the banter between Marek and Pete, I just didn't feel invested in their relationship. The book wasn't horrible it just wasn't for me. Edie lives in Vermont with her husband, two sons, and random creatures that might or might not be pets. She loves libraries (where she's found play, work, and love since she was a kid), long walks (unless ice is involved), lewd language (in the right context), luscious romance (of any variety), and alliteration. 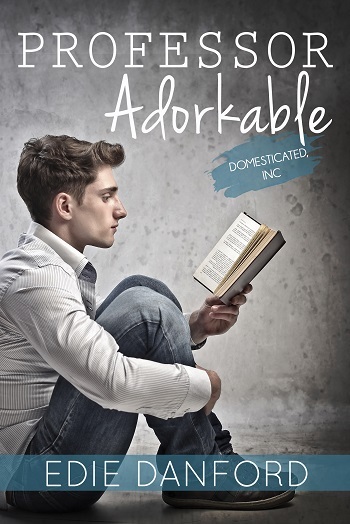 Reviewers on the Wicked Reads Review Team were provided a free copy of Professor Adorkable (Domesticated Inc #1) by Edie Danford to read and review for this tour.